Project a ping pong ball by igniting hair spray. Cover the end of the paper towel tube with duct tape. Cut a small hole in the duct tape the same diameter as lighter nozzle, push the lighter through so about 6cm extends inside the tube. Tape over any gaps and secure the lighter. Bridge the ruler between the paper towel tube and the lighter, to strengthen the device. 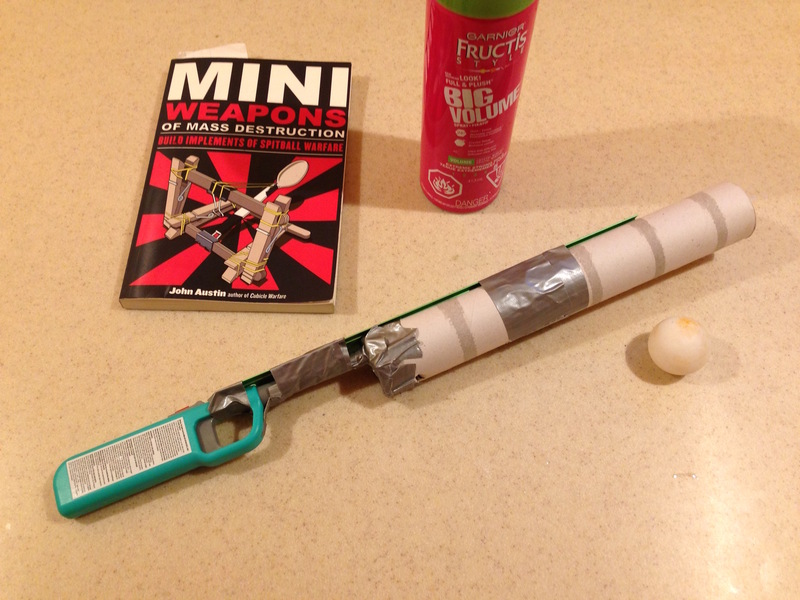 To fire: spray some hairspray into the paper towel tube, drop in a ping pong ball, then ignite the lighter. The device works by a combustion reaction: the alcohol combines with the oxygen in air and is converted to CO2(gas) and water. The reaction is started by the energy of the lighter, and then can continue on its own. More and more gas is made in the confined space behind the ping pong ball, until the pressure of the gas is enough to shoot the ball forward.